"Football is entertaining" - both a fitting description of the beautiful game, and the weekend's game between Kingston Clippers and Master's Saints, by Master's FA Saints' coach Junior Groves. A 1-1 scoreline would typically describe a tightly fought affair with few chances on goal and a couple of lucky breaks. For the rematch between Master's FA Saints and Cataraqui Clippers, it was nothing of the sort: seven times the woodwork was hit; two spectacular bicycle kicks were attempted; a header off the line and a diving tackle in front of an empty net saved certain goals, and all of this prevented the final score from reaching double digits. The game started off a bit tentatively, much like the previous meeting between the two sides that was won 3-0 by the Saints on the opening weekend. 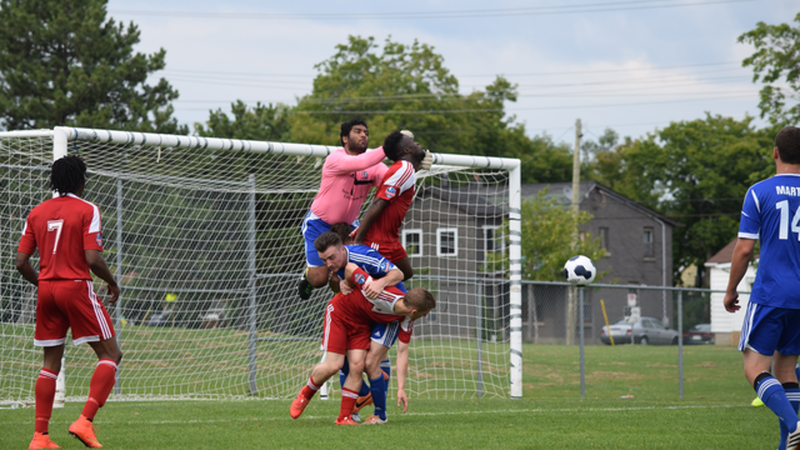 The tentative start would change very quickly though, as Clippers forced Master's GK Shane Lopez into two early saves, Saints' Franck Keoybi put a bicycled shot just wide of Navi Sidhu's goal at the other end of the pitch, and Saints' Alexander Dimitriu scuffed a chance on a poor clearance with a gaping goal to hit. The frenetic pace could not be sustained by either team, and by the midway point of the first half both teams were settling into an absorb-and-counter game when playing defenisively, and a possession game when on the attack. In the thirty-fourth minute, Leshorn Woods-Henry was cautioned for persistent infringement after three tough fouls in quick succession. Four minutes later, Saints' head coach Andrey Savelev made his first change, withdrawing Andre Kwami Miller for Simone Orlandi in a like-for-like switch on the right wing. In between the caution and substitution, Clippers' Jason Massie bicycled a cross over to Dylan Bams, who put his close-range shot just wide of Lopez' right post. Both teams had been suffering through injury woes of late, and while the Saints were welcoming back their main striker Leshorn Woods-Henry, Clippers had to push one of their own strikers, Oliver Coren, into the middle of their backline. Coren shone in his role, stopping several good chances by Dimitriu over the course of the game, including the followup to a breakaway stop by Sidhu in the forty-second minute of play, when he dove-in to tackle away the ball, saving a certain goal and ensuring that the teams would be deadlocked at 0-0 come halftime. For the first time at a Clippers' home game, no changes were made at half by either team. Despite the lack of changes, the both teams came out with a strong attacking flair and the play went from end-to-end of the pitch very quickly, with the best chance coming when Antonios Assaad put a header past Lopez but only managed to shave the top of the crossbar with it. The Saints made their second change in the fifty-ninth minute, bringing on Thomas Winski for Louis Brazil and within a minute were looking at the serious possibility of having to make an injury change for Keoybi after he was fouled by Coren, earning him his first caution of the match. Fortunately, Keoybi was able to continue after being tended to. The free kick came to nothing, but as the play went down to the other end of the field, Massie teed a shot up from just over thirty-five yards out that had everyone beaten, except for the post. Both teams made a change in the sixty-ninth minute, with Clippers bringing on Luke Phye for Timothy Campos, and Saints changing Dimitriu for Trae Green. The change paid off within twenty seconds for the Clippers, as Stephane Emard beat his man on the left and slotted a hard shot along the ground past Lopez inside his far post to give Clippers the 1-0 lead. They managed to hold that lead, even pushing for a second goal for the next ten minutes, but Coren's only mistake of the game came in the eightieth, as he mis-timed a tackle in the area resulting in a penalty, his second caution of the game, and an accompanying dismissal. Keoybi stepped up to take the penalty and Sidhu read it well, getting both palms on it, but it was too powerful to keep out and the game was tied 1-1 with under ten minutes to play. The goal resulted in a myriad of changes by both teams, with Clippers replacing Tommy Hong with Stuart Heath (returning from a month-long injury battle), and Assaad with Boris Baker. Meanwhile, the Saints replaced Woods-Henry with Aaron Trotman-Grant (a past Clippers player), and the goalscorer with Sam Gardner. The changes suggested that, despite going down a man, the Clippers were going to continue to pressure the game, while the Saints removed both strikers to revert from a 4-4-2 system to a 4-5-1 system. As full time approached, Green hit a shot from the top of the area which hit the crossbar, the fourth crossbar of the day. The Saints began to step up their play and control the midfield, getting the best chance of the remaining time as Sidhu stopped Green close-in, and Kamden Holder was unable to get his shot on target, hitting it well over the bar. After that chance, Clippers pushed hard the other way looking for the late winner, but the final whistle blew on an entertaining 1-1 draw. Groves was a bit disappointed with the end result but pointed out that his team, like the Clippers, was in a two-year building plan. He was also quite pleased with how well his team's tactical plan had worked as planned and at how well the youth players had competed in the game. On the other bench, Chris Eveleigh stated that with "lots of possession and passing, his team was playing in a different way. The lads are buying-in, and we all came away disappointed." He also said that he felt that the Clippers were one of the best teams in the league, in terms of the play on the field, and that the results just haven't been going their way to prove it.